We know—it’s hot y’all. With temperatures climbing toward the 90s by 9 a.m., those of us privileged to live in and visit this gorgeous state get pretty desperate to keep cool. But that’s no reason to stay indoors. The spring-fed creek at Tannehill State Park. Just over half an hour from Birmingham’s City Center, Tannehill is a fun place to go camping and beat the heat. 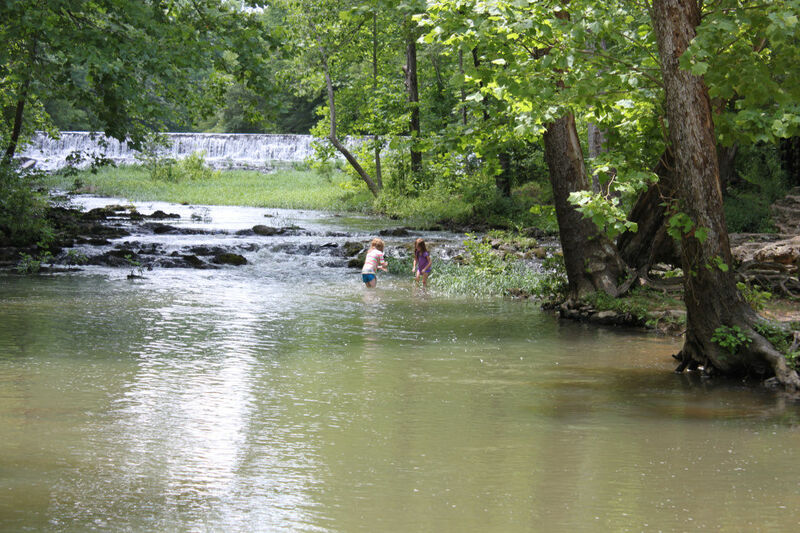 The campsites are surrounded by tall shade trees, and a spring-fed creek snakes through the area offering plenty of fishing and swimming. Besides being a pretty and historical place to visit, it's also a cool one that will offer you lots of natural comfort while still enjoying the serenity of camping life. 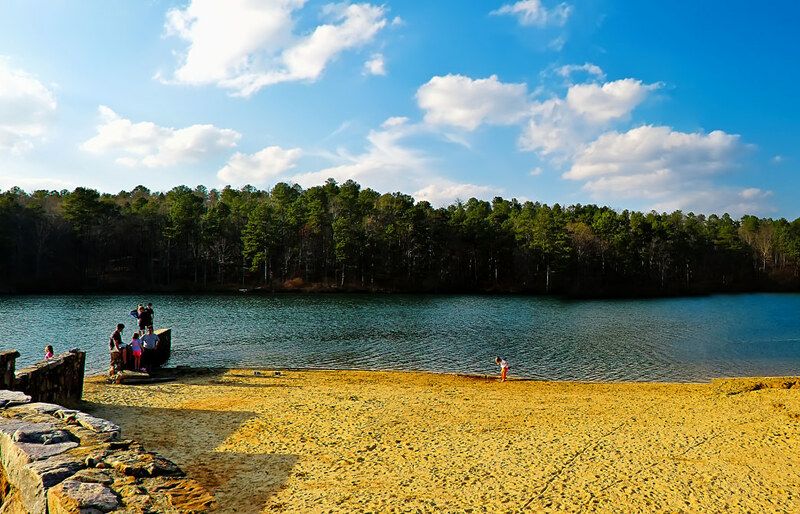 Enjoy the beach at Oak Mountain State Park. You can't say enough good things about Oak Mountain , the largest state park in Alabama at 9,940 acres. With all that room, there's plenty of choices for staying busy—and cool. Only a half hour from Birmingham, Oak Mountain several fantastic overlooks. You can splash in the natural pool at the base of Peavine Falls (after a good rain), or lounge on one of the two beaches. There are more than 50 miles of trails for hiking and mountain biking, but you'll probably want to hit those early in the morning. In the heat of the day you should hit the water. Boat rentals are available, or you can try the Flip Side Watersports park, in which you can glide across Beaver Lake on a wakeboard cable system. (Don't worry, instruction is available.) If you're more interested in human-powered watercraft, stand-up paddleboards are available to rent as well. When listing places to go hiking or camping with available swimming, DeSoto State Park always makes the cut. With wild and untainted beauty, scenery worthy of filling up your camera’s memory card, and an endless number of places to get in the water, DeSoto State Park is worth multiple visits. Only an hour and a half from downtown Birmingham, this state park provides various types of camping (improved, primitive and backpacking) as well as rustic cabins and mountain chalets. Nearby Little River Canyon makes this area a multi-faceted paradise. Canoeing and kayaking are available as well. 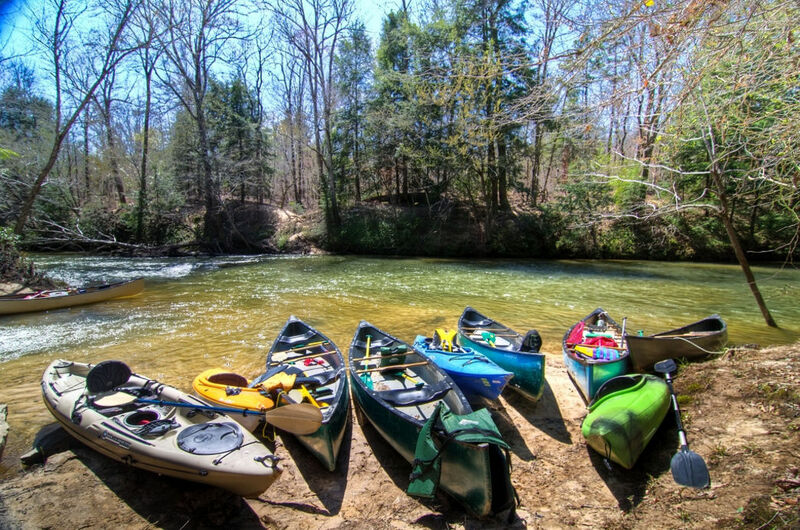 Clear Creek offers plenty of paddling opportunities. 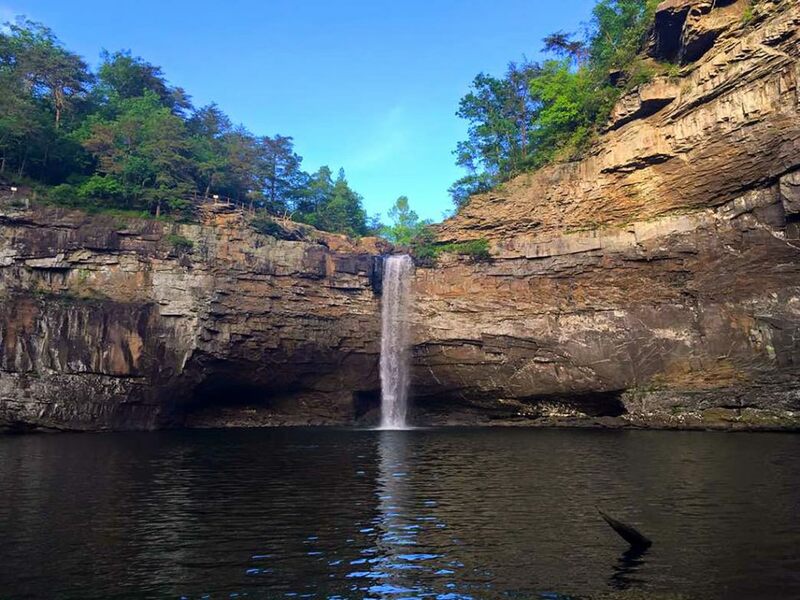 Located in the Bankhead National Forest in northwestern Alabama, Clear Creek is the largest recreational area on the ever-popular Smith Lake, which provides 21,000 acres of clear, deep water that always seems to be perfectly cool. Many of the camping sites are shaded, and the swim beach is a favorite among the locals. Known as “The Land of a Thousand Waterfalls,” the area includes abundant streams, old-growth forest, and plenty of lush canyons to explore. There are also plenty of opportunities for excellent fishing on the 500 miles of the lake's shoreline. 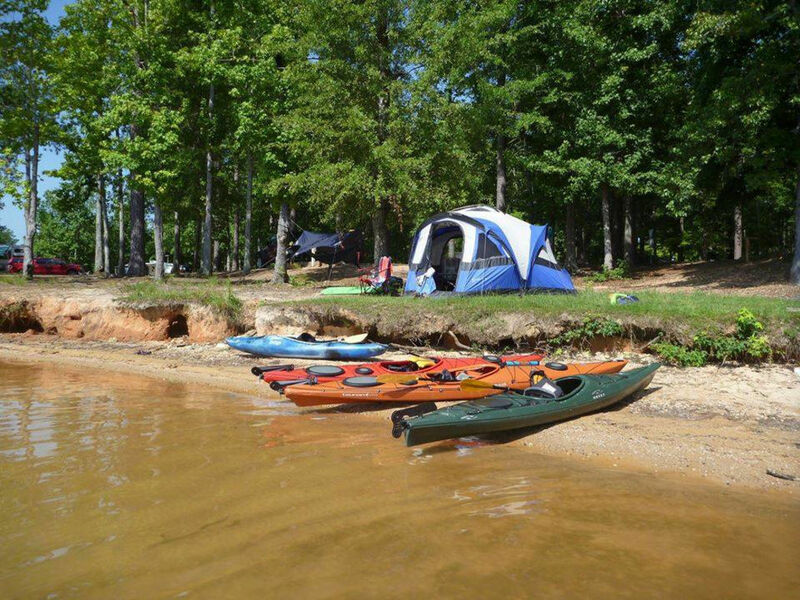 You can rent canoes and kayaks at Wind Creek State Park. Only an hour and a half from Birmingham, Wind Creek State Park is a no-brainer if you’re looking for a place to camp and stay cool. With a beach area and a nice, cool lake, you’ll have no trouble finding relief from the heat of summer. A nearby ice cream shop called Creem on the Creek has cold cut sandwiches an—you guessed it—ice cream. Paddle boats, canoes, and kayaks are also available for rent if you’re in the mood to keep moving rather than lounging. Just under an hour from Birmingham, headed north, you’ll see large signs beckoning you toward DeSoto Caverns Park. Our advice: Follow them. 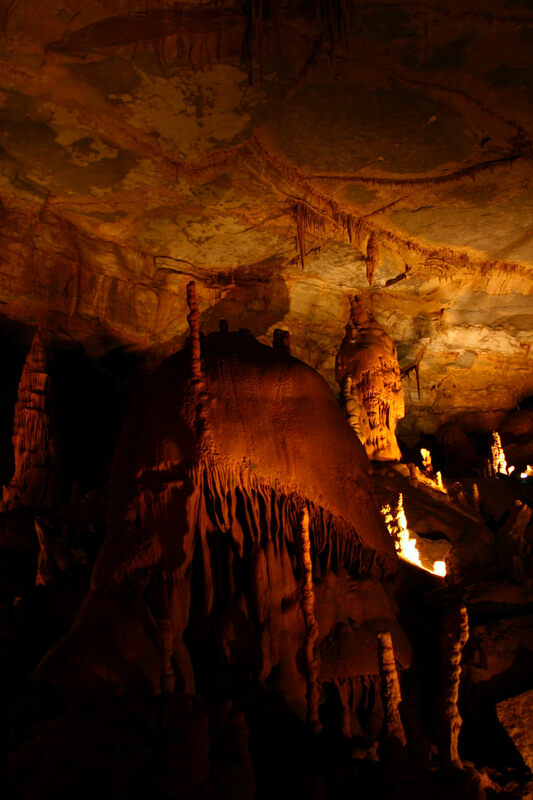 DeSoto Caverns Family Fun Park offers many reasons to pay a visit. A campground has shaded sites and nearby caverns, a guaranteed way to keep cool. The caverns (known locally as Kymulga Cave) have an impressive main room 12-stories high, a sight you simply must see for yourself. Rickwood Caverns is a fascinating (and brisk) place to visit this summer. 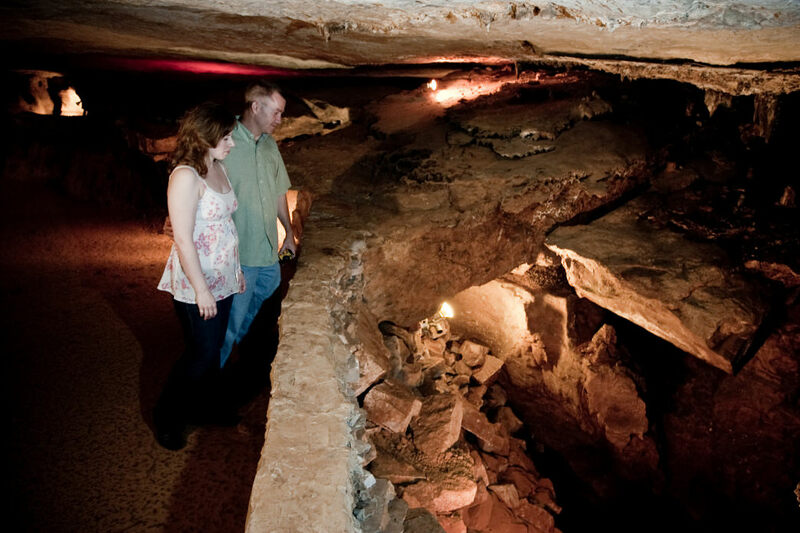 Giant rock formations 175 feet beneath the surface will leave you in a state of wonder as you tour the cooler underground parts of the earth. With constant temperatures of 58-62 degrees Fahrenheit, it's like a natural air conditioning, and only half an hour outside Birmingham, with plenty of nearby campsites, it's a great place to spend an entire weekend. Cathedral Caverns will make your hour and forty-five-minute drive from Birmingham well-worth the travels. Originally called the Bat Cave, this cave earned its name from its cathedral-like appearance. Inside, you’ll find a formation known as “Goliath,” one of the largest stalagmites in the world measuring 45 feet tall. You’ll find yourself in awe of the beauty of these caverns, which keeps a temperature of around 60 degrees year round. With improved, primitive and backcountry camping sites, you’ll want to make this trip a multi-day affair.